Geo-Environmental Services Limited, working with EBP South (Education, Business Partnership South, are keen to support young people in developing their skills in order to help them when they do start looking for a job. This year we had Niamh Roberts doing work experience with us. Niamh was doing market research that was used in our 2018-2023 business plan, as well as helping with other administrative tasks. We wish her the best of luck with the remainder of her studies. We have been offering work experience to people for the last 10 years, some of whom have gone on to work with us. 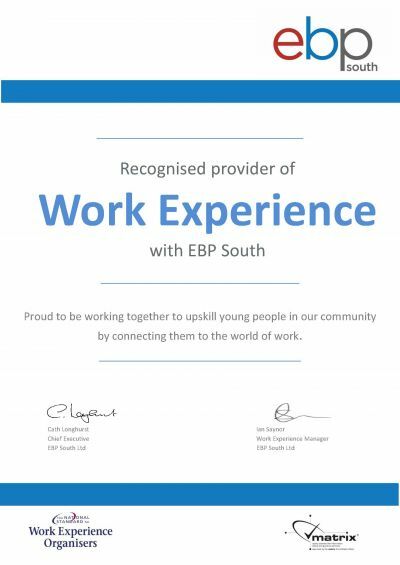 EBP South (Education, Business Partnership South) are a registered charity, established in 1997 with over 20 years’ experience in providing career inspiration, preparation and experience to young people that is accredited by the Matrix award. “Our mission is to inspire and prepare young people for the world of work.